What a beautiful August morning this is! Refreshed by a month-long vacation, I returned to work on Wednesday, eager to engage today’s Gospel story of Jesus walking upon the water. I began work on the sermon for today, convinced that together we would be able to engage the text from our perspective as a “progressive Christian” community. Bearing in mind that summer Sundays require a light touch because most of us are busy enjoying ourselves and few of us are interested in anything that might interrupt our summertime vibe. So, even though the orange fellow down below our border issued an asinine incendiary threat that raised the world’s blood pressure, I decided not to lean into the fear-mongering that various news media were dabbling in. I selected some hymns for us to sing that would allow us to lightly touch our desire for peace on this summer morning and I began to prepare a little story that would help us to see that it matters how we approach the biblical stories; especially the stories in which Jesus engages in miracles like walking on water. So, I do have a gentle sermon designed to encourage us all to be the kind of Christians who look beneath the surface of this story to see beyond the miracles so that we can begin to understand the man that Jesus was rather than the super-hero that Christ has become. So, let’s get out of our boat to walk on the water toward Jesus. But I warn you that once we dip our toes into the murky water we will begin to drown in the words, words, and more words, words like: “Fire and fury!” “Locked and loaded!” the words of Donald J. Trump Murky words like: “In the case of North Korea, God has given Trump authority to take out Kim Jong-Un, …the bible, in the book of Romans, is very clear: God has endowed rulers full power to use whatever means necessary—including war—to stop evil.” these are the words of the Rev. Robert Jeffress – who is touted as #45’s favorite pastor. If only it were that simple. But dear friends this boat of ours has far too many holes in it that have been plastered over too many times and the waters upon which we sail are just as murky. As long as children in this country languish in poverty, because of the colour of their skin, on Aboriginal lands bereft of safe drinking water we cannot claim the moral high ground. As long as, the very mention of “Black Lives Matter Toronto,” evokes an ambivalent response from us, we cannot claim that systemic racism does not inhabit our treasured institutions. As long as, we can continue to close our eyes to the sale of military hardware to Saudi Arabia, or ignore the civilian casualties in Arab nations, we cannot claim that we care about brown or beige lives; especially if they happen to be Muslim. As long as, we fail to confess our own white privilege we cannot claim that we are part of the solution. For years and years, I believed that my status as a woman together with my status as a lesbian, shielded me from the charge of white privilege. After all, I belong to two groups who suffer from discrimination. But when I examine my life, the reality of my white privilege screams out to me from the depths of who I am. As s child, the government of Canada paid my airfare and the airfare of my family so that we could immigrate from Belfast to Canada. The government paid for me to come here at the very same time as the government was tearing children from the arms of indigenous parents and forcing those children to suffer the abuses of residential schools. My white privilege allowed me to grow and thrive in Canada despite the realities of the discrimination of women and LGBTQ folk in this country. As long as, far too many of us fail to face up to the realities of the privileges we enjoy as a result of our race, the horrors of the murdered and missing indigenous women of this land that we love, will continue be swept under the carpet of our nation’s denial. 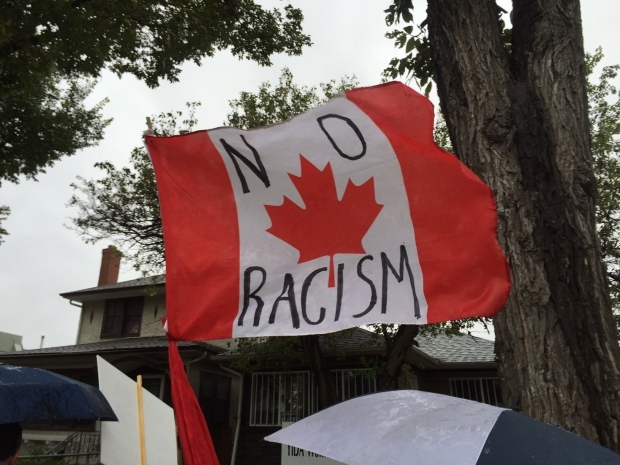 Racism is rampant in Canada. From the indignant rants of white supremacy to the more subtle denial of white privilege, racism stretches from coast, to coast, to coast. As long as, in the deep dark recesses of our fear filled selves, we entertain, even for a moment the notion that maybe, just maybe, there might be some surgically precise nuclear option, just the right amount of collateral damage that could take out Kim Jung On or Assad, or maybe even Putin himself. As if any amount of collateral damage might be acceptable simply because after all is said and done: “they” are not like us; we must confess that this kind of tribalism reveals that racism lurks in us. This Christian ship that we have all climbed aboard does not protect us from the charge of systemic racism. Our own ELCIC struggles to move beyond tokenism when it comes to diversity. There is so much that we need to learn from those brave few who have struggled to dwell among us, but our fear of difficult conversations, causes us to remain silent. Our silence screams loudly of our desire to remain unchanged by our sisters and brothers who do not share our skin-tone. These are murky waters indeed. I do feel like I’m sinking here. I’m finding it difficult not to be afraid. Jesus words appear stilted on the page: “Do not be afraid.” I long to return to the lazy, hazy, crazy, days of summer, those days of soda, and pretzels, and beer. But as the waters lap around my feet, I am compelled do what most people do when the feel they are about to drown: I take a long deep breath and I wait. One deep breath is followed by another. As I breathe in and out, the murky waters continue to lap at my feet, but the noise of the shouting crowds hollering back and forth across the media, fall away, and all I am left with is the sound of my own steady breathing. In and out. As I breathe, I begin to hear the sound of a still small voice, the Bat Qol, the daughter of a sound, a gentle whisper, a voice from within. The voice is so still and so small, the whisper so gentle, that I cannot distinguish a sing word. I can only feel the shalom that washes over me. Shalom, peace, Salam. In the quiet of our very selves, the ONE in whom we live and move and have our being speaks, in Hebrew the “Bat Col”, the daughter of a sound, a gentle whisper… Shalom, Peace, Salam… Why did I doubt? Finding the courage to step out of the safety of our small boats, the wind will die down. Do not be afraid. There is more than enough privilege to go around. Do not be afraid. Love begets Love. Do not be afraid. Walking on murky water is a daunting task, but walk we must if we are to follow in the footsteps of the ONE who calls us to be about the work of justice so that peace can be restored among us. Do not be afraid. There is more than enough privilege to go around. Love begets Love. Do not be afraid. Walk in, with, through, and beyond, the ONE who is, was, and shall be, our LOVER, Beloved, and LOVE itself. This entry was posted in Evolutionary Christianity, Home, Progressive Theology, SERMONS, Theology and tagged emergent theology, evolutionary christianity, Lutheran Sermon Matthew 14:22-33, progressive Christian sermon Charlottesville, Progressive Christian sermon Matthew 14:22-33, progressive Christian sermon racism, progressive christian spirituality, racism in Canada by Rev. Dawn Hutchings. Bookmark the permalink.